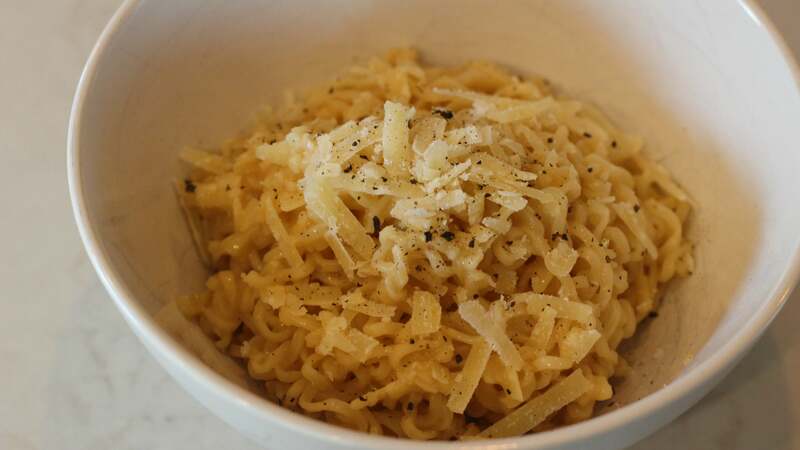 I recently asked some Lifehacker readers for their favourite ways to jazz up the infinitely riffable instant noodles and, my friends, they did not disappoint. There were so many good and interesting ideas — and I mean very interesting — and I was a little sad I couldn't make them all. Below you will find what I did make, and I hope you find each dish as enjoyable as I did. To kick it up several notches into a meal, I like to put 1 strip of bacon into the saucepan before I boil the water and cook it well, stirring to lightly grease the nonstick sauce pan. I then remove the crispy bacon and toss in 1 sliced button mushroom to lightly sauté in the bacon grease THEN I add the water (or low sodium broth) and boil it. When the water is boiling I add the noodles and broth and follow the package directions while I chop up the strip of bacon which I add back in when it's all cooked. I was initially worried that the bacon would make everything too salty, but it didn't. 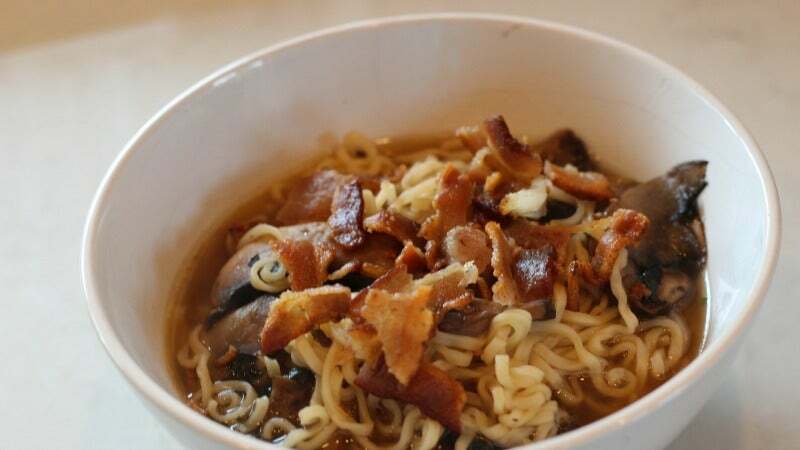 The soup just tasted meatier, with the umami-factor way upped by the cured pork and 'shrooms. Best of all, I didn't even have to dirty an extra dish, as this is a one-pot wonder. One thing I like to do if I'm using instant ramen is throw it in a frying pan with only half the recommended water and cook it down until there's no runny soup left and it's sort of like a stir fry. 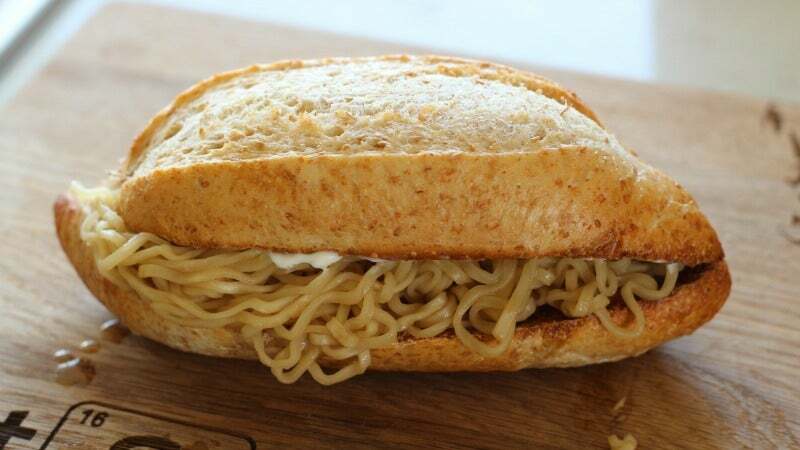 I then grab a hoagie roll, gut it down the middle and throw the noodles in it (this usually makes two). As you can see from the above photo, I couldn't resist adding mayo, because there are very few savoury sandwiches that don't benefit from a little mayo. I'll admit that this sandwich felt a little wrong at first, but it tasted very right. Salty, slurpy noodles on a soft, chewy roll? Yes please, and I dare say the mayo provided a much appreciated bit of tang. Though Given2Dream listed this as their "trashiest application" for instant noodles, I found it to be almost refined. My trashiest application was christened "Ramen-Fredo" in college. Boil the noodles by package directions, adding the flavour packet with the noodles. Drain (or drink) the broth, but make sure there's a little liquid left. Then add butter and Parmesan cheese. With the leftover broth, the butter and parm make a sauce that is (very) vaguely reminiscent of alfredo. Then slurp away! Given the fact that this was a university meal, I suspect Given2Dream had used the shaker parm, but I had to try this with the real stuff. After the noodles were done cooking in the broth, I drained it off as described and reserved it. I then added butter and cheese to the hot noodles, stirred to get everything nice and melted, then added back in just enough broth to get things saucy. I topped it all with some more cheese, ground on some fresh pepper, and slurped as instructed. I won't tell you that it tasted like Alfredo, but I will tell you that it tasted very good. This makes sense though, because it is hard to go wrong with butter and cheese. 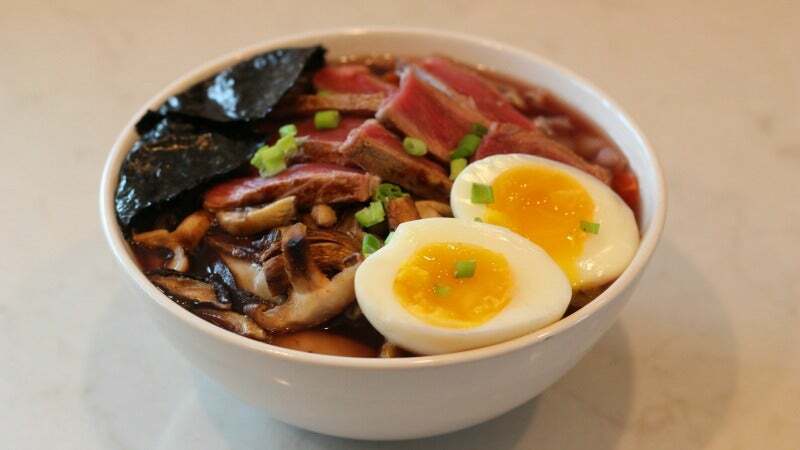 How do you make instant ramen meal-worthy (and somewhat healthy)? Shiitake mushrooms, seaweed, chopped veggie mix (carrots, onion, cabbage), and either turkey, chicken, or beef. And a hard-boiled egg, of course. THEN — and this is important — I add a little Better Than Bouillon and some fish sauce to the broth to make it extra yummy. You all know that I am Better Than Bouillon's biggest fan, so I immediately trusted Patrick and all of his ramen-centric suggestions, and am happy to report that he did not steer me wrong. I cooked the cabbage, onions and carrots in the broth — hot tip: Purple carrots will turn your broth purple — and sauteed the mushrooms separately to give 'em some colour. For the meat, I went with some barely seared beef, and I think it was a very good decision. As you can see from the above photo, it made for a very substantial, almost decadent bowl. Basically, you are all noodle geniuses, and I applaud your skills and ingenuity. I look at ways to lahksa-fy stuff. By that, I mean those cheap jars of simmer sauces, basically plonkged over a pack of 2 min noodles. Make one up as per instructions, but add a little more fluid. Idea is to make the final product more of a soup. Cook up the noodles and plonk em in a bowl (or cook em in the simmer sauce), then add the simmer sauce product over the top. Voila! Instant lahksa. works best with curries of course, but other simmer sauces should be fine as well. Next time I make some bolognaise (which generally lasts me 3 or 4 meals) I'm going to try noodling it. Cant see why it wont work.